Frank Thorne is best known for his loose work featuring well endowed scantilly clad warrior women, like Red Sonja, Ghita and Lann. But before that his work was a lot more conservatively inked, especially when he worke din newspapers. 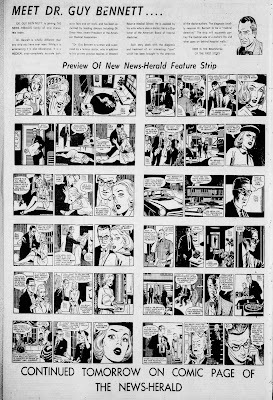 If you follow the links, you will see his earliest work on detective strip Perry Mason in the slick style of Alex Raymond. 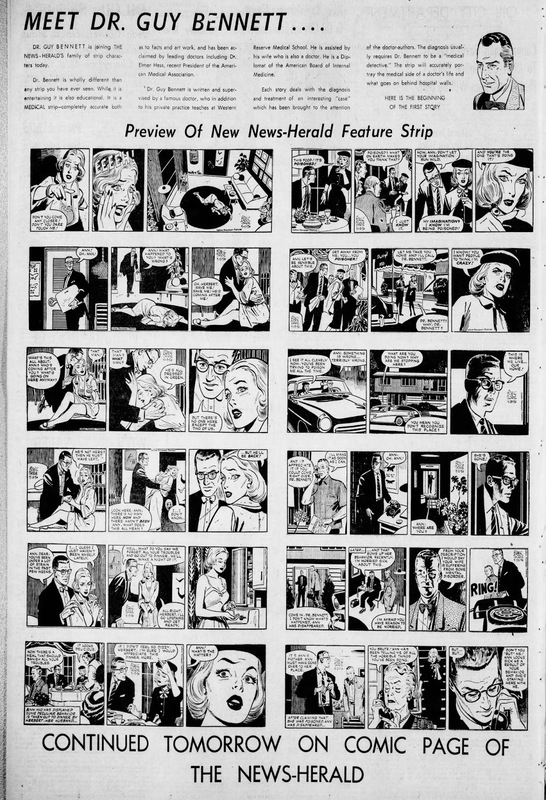 In the late fifties he returned to newspaper comics as the second artist on the remarkably dull Dr. Guy Bennett. This time his style was more in line with the then current soap opera norm as set by Stan Drake and others from what was later called the 'illustrator's school'. In fact, so much so that it may be suspected that he ghosted some of those here and there. I have gathered all my Guy Bennett strips, which mostly fall into two longer runs from 1956 and 158. These include some I have shown earlier, but in a more complete setting.